If your dentist has identified your child’s first cavity, you’re likely concerned about how to keep them calm during follow-up treatment. Fortunately, there are several strategies available to help your child overcome anxiety and streamline the treatment process. 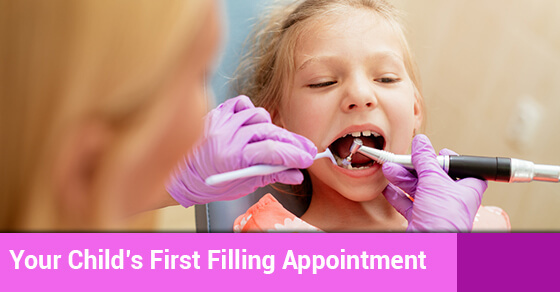 In this latest post, our Toronto kids dentistry team presents a guide on helping your child through their first filling. Your child will need lots of encouragement and calming reassurance during the treatment process. Try to help them by not making it seem as if they’re being punished for not brushing their teeth properly. You’ll have lots of opportunities in the future to help guide their dental hygiene strategies. Make sure your child has simple information about the process. Emphasize that any pain they might feel is only for a very short period of time, and that there are clear benefits to having the filling placed now rather than later. Make sure you reassure your child that the dentistry team has their best interest in mind and remind them that they can communicate with the dentist at any time if they don’t feel comfortable. Help your child understand the process by discussing your past filling experiences with them. Make sure they understand that the process is completely safe and that the filling has helped to keep your teeth strong over many years. It will help your child to see that you’ve been through the process and your oral health is improved because of your fillings. If you feel as if your child is unable to go through the filling process without significant anxiety, then you might consider sedation for the treatment process. Discuss the options with your dentist to see which types of sedation might be suitable for your child and their unique treatment needs. Once your child has successfully gone through with their filling and has seen that the process is not as difficult as they first feared, you can take further steps to protect their oral health for the future. Guide them on oral health practices that prevent cavities, such as brushing and flossing. You might spend several consecutive days with your child in the bathroom each morning and evening as they brush their teeth to make sure they have the ability to prevent cavities for the years to come. To learn more tips on how to help your child through the cavity treatment process, call our team today.